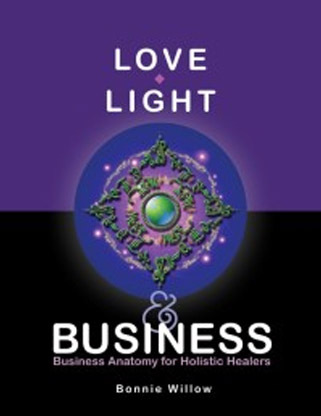 Holistic minded healers and spiritual business owners may not be the most business-savvy people. Conventional business principles may seem repugnant to them. There is a new business paradigm gradually forming, and this book and class capture that change. There is so much more to running a business well, other than simple advertising and performing the service. This class, based entirely on the book, compares the anatomy of a business to the anatomy of a human body. This unique perspective helps healers to understand why various processes are so necessary in order for a business to survive and thrive. All topics are presented in a lighthearted way, frequently in easy-to-grasp worksheet formats. Some of the most popular topics covered: Creating your brand identity, mission statement, features and benefits, tag line, elevator pitch and unique selling proposition. Bonnie’s creativity helps you find your own voice and vision and make it crystal clear. She works with each student to craft the best possible version of what you are creating. The goal is for each student to come away from each class with tangible plans and materials to apply to their unique business. Most often, a client requests a few classes on a certain topic. In that case, each class is $32. Alternatively, all of it can be presented as a series of ten weekly classes. The entire course can be taught in a series of 4 weekend workshops.